This is the OTHER ring to rule them all. 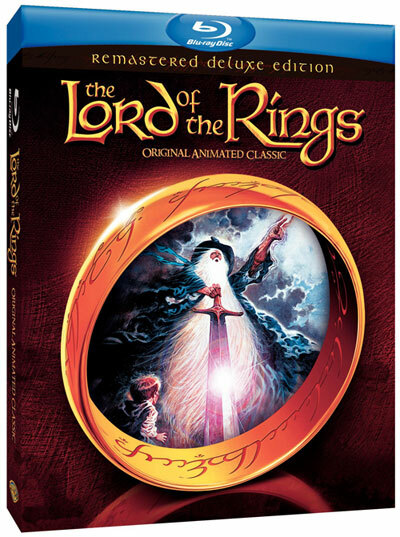 Long before cinemaphiles were treated to the big screen live action adaptation of the classic Lord of the Rings, there was an animated feature that desperately tried to capture the imagination of JRR Tolkien to the screen. And from what I recall it did a pretty good job at it! Well that classic animated feature is being remastered, and re-released on DVD and Bluray this April. Journey back into the world of Hobbits, Humans, Elves and Dwarves in the all-new The Lord of the Rings Remastered Deluxe Edition coming April 6, 2010 from Warner Home Video. This original animated classic from acclaimed director Ralph Bakshi and Academy Award Winning producer, Saul Zaentz, has been remastered with pristine New Dolby 5.1 audio and picture quality and will be distributed as a single disc DVD and Blu-ray combo which features a Blu-ray, DVD and bonus digital copy. The film will also be available for Digital Download. This film is rated PG. illustrated film, his pioneering rotoscoping process, and inspirations for his visual storytelling. This was likely my first exposure to all things Lord of the Rings. I watched this animated classic on the movie channel in my youth, and later never managed to locate it on alternative media. So its all pretty blurry to me, but I recall watching it with wonder. It wasn’t until later when I reached the comprehension level to actually READ the Lord of the Rings books, and of course remained a loyal fan ever since. I will be anticipating this release to relive those early fanboy days of wonder.